13-Dec-2011 -- "Vom Nordpol zum Südpol ist's nur ein Katzensprung" ("From North Pole to South Pole it's only a stone's throw away") is a phrase of a 1930'ies aviator song. This phrase stayed in my mind since my visit to the North Pole in 2009 and expresses that the next logical destination to visit would be the South Pole. I never really checked if such a visit is possible until I had to plan my holidays for 2011 and searched the Internet if there is a possibility to go there. I found some information at a web site I normally do not use for travel information: Wikitravel. The listed tour operators offer various trips to the Pole, quite expensive (and you will have more expenses for equipment and flights), but doable for normal people like me. I asked for availability in December and got a positive answer. In addition it would be the hundred year anniversary of Roald Amundsen's discovery of the South Pole and therefore a special trip was planned, which includes the time to spend a couple of days at the Pole. I wasn't aware of the anniversary and it was a pure coincidence that my trip to the North Pole in 2009 was also 100 years after Peary's first arrival at the North Pole (by the way: there are severe doubts that Peary really reached the North Pole, but no one will ever prove that he was not there, thus we trust him). I sat at home, wondered if I really should spend the money and if I could bear the coldness. Amazingly I did this in summer wearing t-shirt and shorts. I searched the Internet for more details and found a web site of a German with a very detailed report about his trip in 2005. I contacted him and got a bunch of very helpful information. Thanks a lot, Christian! Yes, I will do it! One reason is the older you get you will regret things you have not done, the other is that money could also get lost due to economic crises (and you did not have any fun before) and the last reason is that I had two hard years in business and deserved a reward. Thus I booked. Got the confirmation and a booklet with an equipment list. I really appreciated that and strictly followed the recommendation for clothing (mainly fleece stuff). The operator also offers to rent special equipment (like sleeping bags and boots down to -100°C) and I gladly did this. Because I would expect temperatures below -30°C it was advisable to check my electronic equipment like camera and GPS receiver and I bought spare batteries for the camera and Lithium batteries for my GPS receiver. This was a wise decision. The package to the South Pole starts and ends in Punta Arenas, Chile and therefore I booked a flexible flight from Germany to Punta Arenas and a hotel. There is only rudimentary medical treatment possible in Antarctica and it is essential to have a good medical insurance, which covers an evacuation flight to Chile. After all these preparations the day came where I flew to Chile. As I had been in Chile a couple of times before it was a well known stretch for me. I arrived more than one week before the scheduled departure date to Antarctica in Punta Arenas. I did this because I feared that the Puyehue volcano could erupt and delay the flight from Santiago de Chile to Punta Arenas (as it did in June 2011) and I had lots of holidays anyway. During these days I rented a car and did some sightseeing and tried to visit the Confluence Point 53°S 070°W. Two days before the scheduled departure a member of the tour operator came to my hotel and checked my equipment. I appreciated that the operator took so much care of their customers. The next day we had a briefing and were told that we had to stand by from 6.30 a.m. on. They would phone us at the hotel and we should be ready for departure within a short time. The reason to "stand by" is the basic rule for traveling in (Ant-)Arctic areas: The schedule is made by weather conditions and nearly all announcements contain the phrase "weather dependent". This trip is no exception. The airplane must have good visibility to land safely in Antarctica. On our scheduled departure day, the 9th December 2011 the phone rang at 7 a.m. and I was told I should be ready for departure. A bit later a bus picked me up from the hotel and brought me and the party to the airport in Punta Arenas. We embarked an Ilyushin 76 aircraft. This is a Russian built military cargo aircraft, designed for extreme coldness and to land on rough runways. Four hours later the aircraft landed smoothly on a blue ice runway in the middle of Antarctica. A blue ice runway is a runway on bare solid (i.e. : blue) ice, cleared of snow. There are not many places in Antarctica with such kind of ice, which allows to land with wheels. After a long braking distance we left the aircraft and stepped out in a windy area at 79°46'S 083°16'W. The location is called Union Glacier and has a spectacular scenery: Ice, white snow, blue skies, surrounded by the Heritage Mountain Range. I admired the landscape and was very happy. The Camp at Union Glacier was our first stopover on the way to the Pole. The operator erected this field camp to serve as a hub for all the operator's Antarctic activities. Beside the tourist flights to the South Pole the operator also offers a "ski last degree trip" to the Pole and to climb Mount Vinson, the highest mountain in Antarctica located 146 kilometers from the camp. In addition the operator offers customized Antarctic logistics to everybody and supports also national research programs. They choose this site, because the blue ice runway needs to be in a windy area (to keep the snow off the ice) and to have the field camp within close distance but with as little wind as possible. Vehicles brought us from the runway to the camp in 16 km distance and the difference was amazing: instead of the chilly and windy runway we came to a sunny calm camp, where some staff members dressed t-shirts (only those who worked inside the tents). After I stripped off some clothing we got an introduction of the camp: It is fully self sufficient, pitched up every October and dismantled end of austral summer. There are strict environmental rules ("no pee in the snow!") and all rubbish and faeces are brought back to Chile. I absolutely appreciate that they keep Antarctica clean and pristine! We slept in two men tents on camp beds and due to 24 hours sunlight the interior of the tent was amazingly warm: at bed level 10°C and much warmer at the roof. The outside temperatures were -16°C to -20°C but due to the radiation of the sun, glare from the snow, the lack of wind and the low humidity it never felt so cold at all. Our departure to the South Pole was scheduled for the 11th and in the mean time we did some walking, climbed a peak, made a trip to Elephant Head (special rock formation) and chatted with our travel companions, which consisted Mount Everest climbers and people who have traversed Antarctica by skis. On the 11th we got the news that we could not fly to the Pole today because of bad weather along the route. Some people were a bit disappointed, but I stayed cool. This is normal in Antarctica and also the reason why we spent some days in the camp: to wait for a good weather, which permits to fly. The next day we got good news: the weather improved and we shall pack our stuff, put it outside our tents to get loaded and stand by. At noon the first group embarked a ski equipped Twin Otter (DHC-6) and took off. One hour later the second group (9 passengers including myself) embarked another Twin Otter. For me it was the first experience in a ski equipped aircraft. To my amazement the takeoff and landing was very smooth. It was a fantastic flight. Sun shone and I watched the endless white snow covered flat area below me. The Tom Petty song title Into the Great Wide (White) Open came into my mind. This great white open sea of snow and ice was absolutely fascinating. Other passengers preferred to have a nap and a staff member handed out drinks and sandwiches. "This is a better service than in some commercial airlines!" I thought. The Twin Otter does not fly very fast (about 270 km/h) and the range with full payload is quite short. Thus we landed after 2 ½ hours close to the Thiel Mountains in order to refuel. There is no airport or petrol station here. Instead the operator carried lots of fuel barrels over land to this location at 85°12'S 087°52'W. They told us that in former times they flew-in the barrels and burned one barrel to carry four barrels to this place. After they change to land based transport the ratio is much better, but this shows that a tremendous effort is spent and why the cost of this trip is so high. One staff member stays here during the season not only to protect the valuable barrels but to send live weather reports to the Union Glacier Camp. Good weather at Union Glacier Camp, at Thiel Mountains and at the Pole are mandatory for the Twin Otter flight. Forty minutes later we took off again for the final leg to the Pole. Still admiring the scenery I recalled all the preparations I did for this trip and that the fulfillment of a dream will come true soon. 2½ hours later the Twin Otters descended and a big grey building was in sight. Yes this is the US Amundsen-Scott South Pole Station! We taxied to our parking position and the door was opened. A TV camera was pointed to us and the Norwegian Television interviewed the first man who left the aircraft. "Oops, we left the tranquil camp and are back in civilization?! ", I thought. I was glad that our Turkish fellow Kamil did this job and I could take photos of the South Pole Station in 910 meters distance. But first we walked to our camp. As I mentioned before we spent a couple of days at the Pole and thus the operator pitched up a field camp here. It was also used by the many skiers who skied to the Pole during these days. When we arrived there was great excitement, because the Norwegian Prime Minister Mr. Jens Stoltenberg paid a visit to the camp. I and some other people took the opportunity to ask him for a joined photo and he was very friendly and granted it to all. Tusen takk, statsminister! We were assigned to our dome tents, got a meal and a briefing in the main tent. Our doctor explained us that the Pole is at an altitude of 2837 meters and the physical altitude is more than 3300 meters. The reason for the difference is that at the Pole the air is much thinner due to the centrifugal forces. He strongly advised us to stay at the camp and relax to avoid altitude sickness. We would have enough time for the Pole tomorrow. We sat in the tent for a while, but the more I saw the beautiful weather the more I was tempted to walk the remaining 944 meters. I also knew that I had been in much higher altitudes before and never suffered of altitude sickness. I decided to go. It was the 13th December 2011 (UTC) when I left the tent and followed the groomed way, marked by the ubiquitous flagged bamboo poles. I walked at slow speed. The thick clothing and boots did not allow a faster pace and also in the thin air it is better to slow down. While I was walking I enjoyed the landscape and realized that my long dreamed dream will come true in a few moments. About twenty minutes later I reached the silver ball, which is the Ceremonial South Pole. Some of my travel companions were already there, took photos and celebrated, but my GPS receiver told me that I needed to go additional 90 meters. A bit later I reached a plate with the US and Norwegian flags and I cheered loud: "Yippee! I have reached the South Pole!". My GPS receiver showed the magical numbers: 90°00.00'S! Great joy came into my mind! I am at the bottom of the world, a magic place in the middle of my beloved continent Antarctica! No one beside me was here at the official South Pole marker and thus I quickly used the opportunity to take the photos of the four cardinal directions. Like on the North Pole there is only one direction and this time it is north. Along the Prime Meridian you can see our camp in the distance (located exactly on the Prime Meridian), two Station's tents and aircraft parking. Along 90°E there is the Clean Air Observatory, along 180° gear storage and along 90°W the United States Amundsen-Scott South Pole Station. With glad eyes I watched my GPS receiver and again it was funny to see the longitude values changing every second, because all meridians join at the Pole. If you are patient enough you can wait for your own home longitude displayed and I was glad that I managed to capture this photo! The South Pole itself is marked with a metal stake and a sextant on top of it. Because we were standing on an about 3000 meters thick glacier the location of the Pole marker moves about 10 meters per year (in which direction? North!). 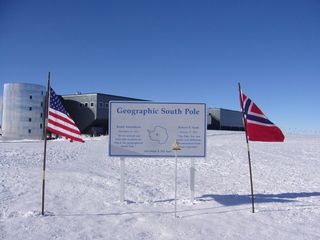 It is a tradition of the Station to survey the current South Pole on every New Year's Day and mark this spot with a new metal stake and a new sign. The old sign is removed, but the stake remains, thus you can see the South Pole marker history on the ice. For the centennial celebrations the Station surveyed the current Pole (as of 14th December) and placed a wooden stake on it. I stood for a while and my visit to the North Pole two years ago came into my mind. I realized that I was exactly on the opposite side of our planet and this was my very first antipodean visit! I proceeded to the Ceremonial South Pole where my Norwegian travel companion Håvard has pitched up his Amundsen replica tent. We lined up like on the original photo of Amundsen and took a very nice picture! Back at my tent I was hardly able to sleep. The excitement was still in my mind. The next morning I went to the Pole again and this time my mates and myself had enough time to do funny things: to walk around the world a hundred times, to take photos with the home country flag, company flag, boy scout badges, mascots and so on. I stood exactly on the earth's axis and this time I really felt centered! It was great to have plenty of time here at the Pole and enjoy. In addition the weather was very favorable: sun, blue skies, no wind and only -32°C. This sounds cold, but appropriate clothing, low humidity and the sun rays made it felt quite comfortable. I proceeded to the two tents, pitched up by the South Pole Station: one contained a souvenir shop and the other informed about the Station's activities and history. Due to the "rush" at the centennial date the Station itself was closed for externals. At midnight of the 14th December (according our expedition time, which was Chilean time: UTC-3h; the Station uses New Zealand time: UTC+13h) all people gathered at the Ceremonial Pole. The Norwegian Prime Minister Mr. Jens Stoltenberg made a short speech and unveiled an ice bust of Roald Amundsen. Norwegian TV transmitted this live to Norway and about 300 people were present. I think this was the biggest crowd in South Pole history. We planned to fly back to Union Glacier Camp next afternoon, but low hanging clouds prevented that. Thus we got an extra day at the Pole. We managed to depart on the 15th afternoon and arrived at Union Glacier Camp after midnight. We all wanted to go to bed, but champagne and a celebration supper was served for us. The night was windy and brought low hanging clouds. No way to fly to Chile today as planned. Some people needed to phone their travel agencies, because they could not depart from Chile the next day. I was really astonished they had a very tight schedule. The morning of the 17th December welcomed us with blue skies and scattered clouds. Our expedition leader told us we will fly to Chile today and we took off at about 10 p.m. Our plane landed in Punta Arenas later in the night. Some passengers remained at the airport for their connecting flights. During the bus trip to our hotels we were welcomed by a phenomenon we had not in the past week: the sun rose over the Strait of Magellan! This was the official ending of the trip. When I returned my rented gear to the office I met one of the company owners and thanked him a lot for this trip and in particular that we had the extraordinary fantastic opportunity to camp at the Pole! I also want to use this opportunity to express my thanks to the staff for their good work and to my pleasant travel companions for the great time we had! I had a couple of days in Punta Arenas until my return flight and reflected the journey: the words of the German poet Max Dauthendey I cited at the North Pole report are more valid than ever. But for the final words I want to cite Erling Kagge's book "Philosophy for Polar Explorers": "One of the most important things is to get up in the morning!" Sounds trivial, but what it really means: one of the most important things is to leave your cozy warm home, go out and have the will to do it! #9: Standing on the earth's axis: the world revolves around me!